The World Cup started in Russia on June 14th, so we thought it would be great to tie it into our camp theme for this week. We looked at the teams favored to win this year and based our days around them, so don’t take it personally if your favorite was not featured! We started off the week with Germany, a strong team that was beaten by Mexico in their first match, but that has since picked up the pace again with a 2 -1 win over Sweden. When we think of German foods, we immediately think of Schnitzel so that was an obvious main dish, which we then paired with an easy egg noodle called Spätzle and a fruity dessert called Rote Grütze. Before we got into cooking though, our campers for the week came up with table names and decorated their team poster. We got to meet The Perfect Pretzels (Germany), The Crazy Cashews (Brazil), The French Fry Waffle People (Belgium), The Octogoats (Portugal), and The Scoring Sugarcanes (Argentina). To dive deeper into German food culture, we did Tasting Stations where each of the campers tried a new mystery food item representative of the country, so today they tried bratwurst, sauerkraut, and pumpernickel bread! The bratwurst was a clear favorite. The Cooking Stations were a lot of fun as well since many campers were able to try frying for the first time and the egg noodles were made using a new-to-us technique involving a colander. After stations, The Perfect Pretzels put the finishing touches on the dishes, and the rest of the camp stayed inside to avoid the heavy rain and played a couple rounds of “Koffer packen” (Suitcase packing) where everyone got to add a favorite item to a suitcase, while repeating all the items already said before, in order. A tricky game to say the least! Afterwards, we all came inside to reap the rewards of our hard work during the day and I even heard that some campers were eager to try the Schnitzel at home. Brazil has been burned in World Cups past, but they are eager and on their way to redeem themselves this year so we decided to honor them this Tuesday by making typical Brazilian dishes Moqueca de Camaroes and Brigadeiros. Moqueca de Camaroes is a stew made using various seafoods and Brigadeiros are a popular chocolate truffle-esque dessert. Today’s craft was making the Brigadeiros so we could let the mixture chill before shaping it into fun, bite-sized balls later. Our next activity was a camp favorite: Snack Wars! Each pair of campers was given some banana, apple butter, pretzel sticks, pumpernickel bread, and the challenge of creating their very own Carnival float (Brazil’s Mardi Gras celebration). We got some great float ideas and would love to see them in the parade sometime! Cooking stations went smoothly, though rolling the Brigadeiros in the cocoa powder proved to be a messy endeavor. It was then The Crazy Cashews’ turn to plate our dishes and they did so splendidly while the rest of the campers went outside to play a remixed version of Chefs and Waiters. Afterwards, we all got together and talked about what we loved about the day and maybe some things we would do differently with the dishes at home. Over all, another great day! Today, we made the trek back to Europe to explore the delicacies and interesting fare of Belgium, a country with a mixing of Flemish and French influences. 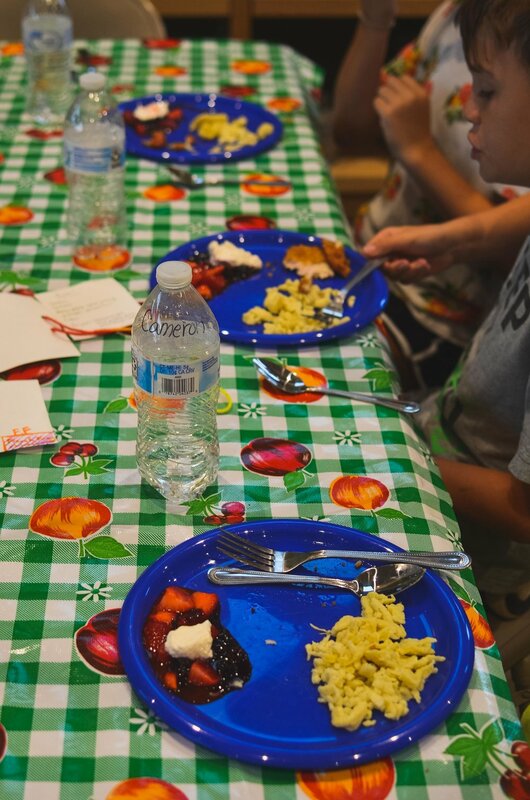 As a first introduction to Belgian food, campers were challenged to make their own frites (fries) and sauce using vegetables, meats, and spices traditionally used in the local fare. After the craft, the campers placed a fierce game of Jeopardy to learn more about Belgian culture; the Octogoats emerged victorious. 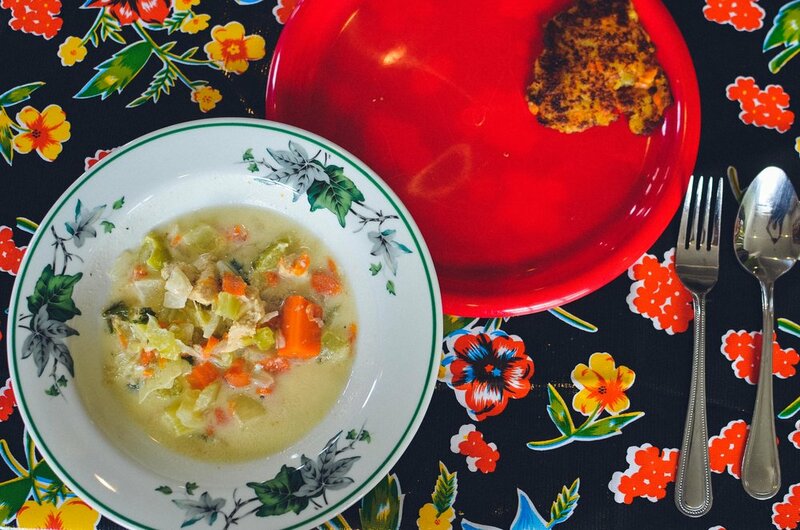 Next it was for cooking, and campers were tasked with preparing Chicken Waterzooi along with a savory waffle containing mashed potatoes and carrots. This waffle was SoFAB’s own twist on the traditional Belgian dish stoemp aux carottes. Cooking was successful, and the French Fry Waffle People helped plate the delicious food inside while the rest of the campers enjoyed a game of Chickens and Mussels outside. It was another great day at the SoFAB World Cup! Thursday brought us to the country of Portugal located on the Iberian Peninsula. The campers lit their burners early with a riveting game of Chopped! In the baskets were the ingredients: cabbage, dried cranberries, tortilla chips, and sausage. After putting their knives together and their brains to work, the Perfect Pretzels emerged victorious with the tastiest dish. Next came the cooking stations where the campers worked to prepare a traditional Portuguese soup called caldo verde along with a sweet, lemony rice called arroz doce. Campers gained experience using an immersion blender to take the chunky soup down to a smooth consistency. They also used a vegetable peeler as a form of zester to get larger lemon peels for the sweet rice. Cooking came to a close, and the campers headed outside to leave their chalk marks on the back patio with their own culinary drawings. After lots of hard work by the Octogoats plating, the soup turned out fantastic while the rice was the perfect treat. Another fun-filled day at camp! On Friday, we traveled back across the Atlantic to land in Argentina for a traditional Argentine asado. This is a familial style barbeque where the meat is seasoned only with salt and pepper and cooked on a parrilla. Before cooking, the campers received cookbooks containing all the recipes from the week. They then decorated them, exchanged signatures with new friends, and noted any changes they would have made. 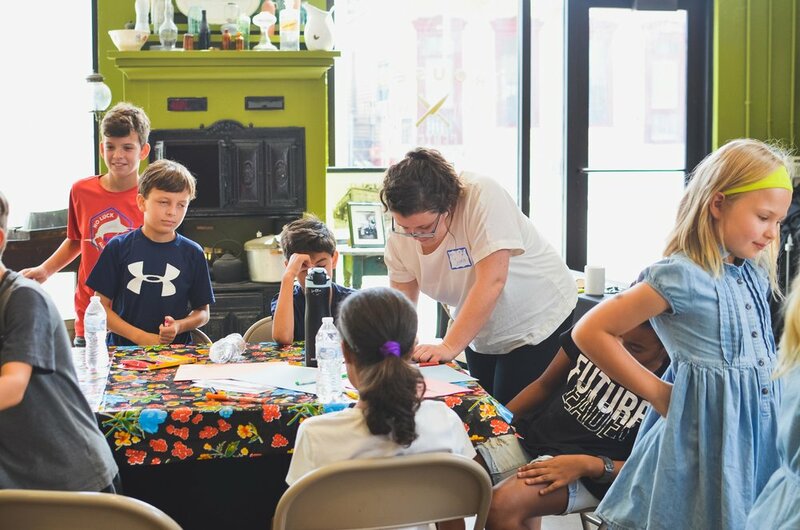 Next, campers played a game exploring globalization of foods through the Columbian Exchange. They discovered where some of their favorite foods originated, for instance that potatoes were first cultivated in South America even though public memory often associates the potato with Ireland. Campers first had to season and grill the delicious steaks for the asado. On the side, they prepared a traditional chimichurri sauce with buckets of parsley, cilantro, and garlic. For a tasty and healthy dessert, the campers made baked plantains, with the natural sweetness shining through during the baking process. The Scoring Sugarcanes worked hard to plate the perfectly cooked steaks and golden plantains. All the campers enjoyed the asado, and it was another fun-filled week at SoFAB Kid’s Camp! Who Came Out on Top at Big Top?